Bring vegetable broth to a boil add quinoa, salt and pepper and simmer covered for 25 minutes. Remove and bring to room temperature. Prepare herbed quinoa and Greek dressing and set aside. Season fish with flour mixture and grill in a pan with 2 Tbsp. olive oil until golden brown. Shred kale into small pieces, chop grapefruit and mix into room temperature herbed quinoa. 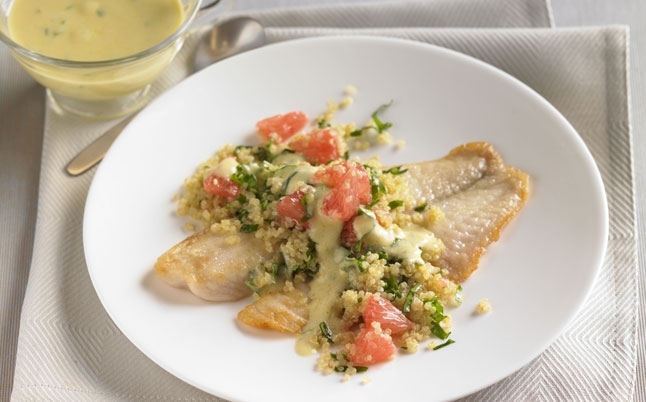 Serve fish with quinoa on top of it and garnish with Greek dressing.